Every single Brink towbar is the best quality and developed to serve for decades. Every Brink towbar is a product of intelligent design, is easy to fit and once mounted is ready for years of hard use, both professionally and leisurely. A Brink towbar has a default warranty period of twelve months on materials. This also applies to the socket and wiring kit. 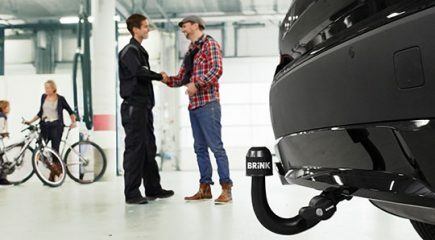 This means that Brink Towing Systems guarantees that the supplied towbar and its components are free of defects that are the direct result of errors in the materials, manufacturing or construction for a period of twelve months. If the towbar has been assembled by a certified Brink towbar assembly station (the Brink Assembly Partner), a warranty of five years applies to both the materials and assembly, starting from the date of assembly (instead of just one year on materials only). Once you have found the right Brink towbar for your car, you are ready to purchase it. Here you can read more about which steps you have to take, what the costs involved are and why you should always get a wiring kit with your towbar.